Yams are healthy and easy to prepare. 4 Should I Soak Broccoli Before Cooking It to Remove Bugs? 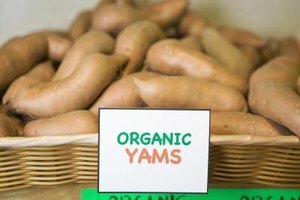 Yams sold in the United States, labeled interchangeably as sweet potatoes by the U.S. Department of Agriculture, are highly nutritious and flavorful, especially when steamed. They are high in vitamins A and C, and are a good source of potassium and manganese. The amount of time it takes to steam yams or sweet potatoes is determined largely by how you slice them prior to cooking. When cut in half lengthwise, then cut crosswise into 1/2-inch slices and placed in the bottom of a steamer basket with about 2 inches of water beneath, it should only take from 8 to 10 minutes for them to cook thoroughly. Steaming retains the flavors and valuable nutrients that could be diluted with simply boiling the yams in water.